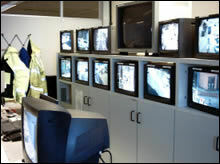 Urban Traffic Control (UTC) is a term used to describe the technique of co-ordinating traffic signals, normally through a centrally located computer. Areas, where signals are relatively close together and traffic flows are high, lend themselves to co-ordination as benefits are achieved by progressing platoons of traffic in an organised fashion. The three parameters of cycle time, green split and offset are set to the most appropriate values to accommodate the prevailing traffic conditions and hence a number of plans will be available to be automatically loaded by computer at different times of the day. The first UTC area in the United Kingdom was introduced by the Department of Transport in the late sixties and was extended throughout the country in the seventies. In London, over 500 signals are co-ordinated and controlled by a central computer and the benefits, which are well documented, amount to almost £80m per annum as a result of the reduction in delay to traffic. In the late seventies the TRL developed a new strategy known as SCOOT, which on a second by second basis operated a co-ordinated traffic control system without recourse to settings calculated on historical data. The system utilised sub-surface inductive loops to detect traffic conditions and the resulting data was transmitted to the central computer where the optimisation process calculated the most appropriate settings of the cycle time, green split and offset. Data is transferred via dd telephone lines from the street. Congestion and loop occupancy are monitored continuously and the program makes small amendments to cycle time offsets and splits. If the modification in one or more of these parameters improves the Performance Index(PI) then this change is made permanent and a further step is made in the same direction until no further improvement is made.